The "Polse", or "Pollice", is a calcareous spire that, with its 1450 meters, overlooks the town of Ziano di Fiemme. For some time I was thinking about facing this ascent, especially after meeting the figure of the great alpinist and alpine guide Alfredo Paluselli, creator of the street together with Carlo Lauton "Mortaleto" back in 1934. A spire that has always fascinated me, being on the vertical home my. Countless times the look has turned to this rock and its cross, which since ancient times has been the source of inspiration for many fables and legends. A daring and demanding mountain path, not to be underestimated especially from the psychological point of view, because of the friability of the rock, but also supported by the degree of difficulty (which in a step I considered VI +). Manuel and I, at the second pitch, we created a vertical variant of a few meters (about 15), climbing up a crack and then moving right towards the pre-existing stop (V °). We both had no guide in hand, so we relied on the sense of orientation and summary news. This is why I wanted to create a relationship, which I hope will be complete and exhaustive, for those who want to try their hand at this company in the future. As a material we used friends, nuts, and 2 nails (one left). It would be useful to clean the way and remove the unstable boulders (which in some places are really big), as well as to close it in the most exposed sections. An unrepeated path, which requires a certain attention to follow it, even if in some places there are some really interesting gray plates. 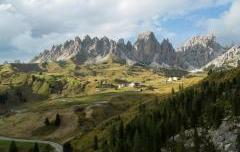 Deserves the ascent above all to enjoy a unique and wild environment, with an exceptional view of the town, the mountains and the Valle di Fiemme. From Ziano di Fiemme go up to the Zanon hamlet and get to the side of the homonymous Hotel, take the path to the Coronelle and continue until you reach the forest fire road. Immediately to the right follow the "Attilio Sieff equipped path". 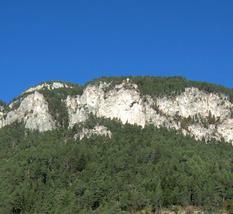 At the end of this, just before the railroad, on the left part a trail on a scree that bypasses the Polse anteriorly. Continue towards the end of the wall in the direction of WEST then turn right towards NORTH, go up a meadow of heathers to the base of the rocks between a rock on the left and a niche on the right, near a pillar. The nails of the attack can be seen here. NDA + medium-big friends, nuts, nails and hammer (some nails in the street are old). The way is spit in some places. The stops are on a spit or on a tree, the last one directly on the cross!